NEW YORK, Sept. 28, 2004 Two national elevator trade groups have joined to create guidelines designed to ensure that emerging technologies not covered under the current code meet equivalent requirements. 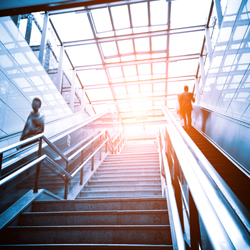 This will help assure the safety of the riding public until the official ASME Performance Based Safety Code for Elevators and Escalators for emerging technologies is published. The National Elevator Industry, Inc (NEII) and the National Association of Elevator Safety Authorities International (NAESAi) have agreed on The Interim Process for the Introduction of Alternative Technologies in the United States. This would address measures not yet covered under ASME 17.1 Safety Code for Elevators and Escalators. The Interim Process for the Introduction of Alternative Technologies can be downloaded from the NEII Web site at www.neii.org and the NAESAi Web site at www.naesai.org. NAESA International (NAESAi) is a non-profit international organization with over 1300 members and nearly 1500 QEI credentialed inspectors. Its members are comprised of elevator inspectors, consultants, contractors, architects, engineers and elevator manufacturers involved in elevator safety, code enforcement and technology. For more information, please visit www.naesai.org.